What's HASC Challenge 2012 ? However, it has been understood that there are still a lot of problems for a large scale database construction. Last year we held "HASC Challenge 2010" with the aim of constructing a large sclae database through technological challenge by cooperation from many people. As a result, We collected the activity data of about 500 people and we could take the first step aiming at the achievement of large scale database construction. 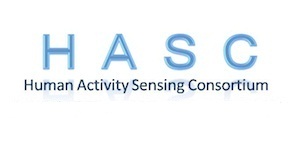 This year, we will discuss the future of Human Activity Sensing based on the findings of "HASC Challenge 2010" and hold "HASC Challenge 2012". In HASC Challenge 2012, we are aiming at data collection, feature and algorithm development, and also at algorithm and tool standardization for human activity sensing through the cooperation of participant. HASC Challenge 2012 Web page Open!